Why not start with the UK government themselves – after all who will have a more rigorous software purchasing policy? The software industry is very fast moving and frequently throws up new developments that initially promise to make great changes in the marketplace, and which ultimately fail to live up to their initial press hype. OSS is indeed the start of a fundamental change in the software infrastructure marketplace and UK Government must take cognisance of that fact. The OSS Policy should be read in conjunction with current advice and guidance on procurement matters from the Office of Government Commerce (OGC). – UK Govt OSS Policy. Version 2, 2004. So it’s a government sees Open Source as a procurement opportunity, as long ago as 2004… “FREE” software must be a good thing. This is the FIRST IMPRESSION that Open Source forges in people’s minds. It’s Free. But is free software actually any good? Is it any good in the context of reliability, scalability, security? Am I making functional compromises? Can I get support? From whom? Do I actually have the skills or the desire to modify it myself anyway? To run an eCommerce operation, in system terms my shopping list is…..
A database to contain my saleable products and their prices, stock, images, etc.. In Microsoft world that’s SQL Server, and in Open source world that’s mySQL. I need a web server capability to show my products to the world. 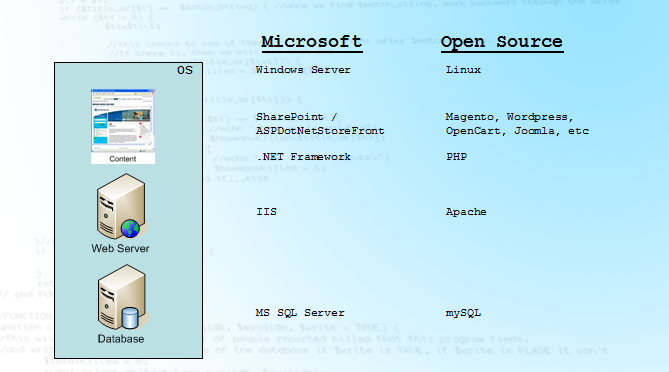 That IIS in Microsoft language, and Apache on the Open Source side. I need a system to manage my content – I could buy one like ASPDotNetStorefront on the Microsoft platform, or choose a myriad of Open Source variants. For customisations I would need to be skilled, or purchase development using Microsofts .NET framework, or using PHP. And of course all of these systems need platforming on operating systems, like Windows Server or Linux for example. So we know what’s out there – I can choose the Microsoft route or the OS route (there are others of course, but in the interests of time…). Cost? Scalability? Functionality? Support? Development? Let’s a very quick look at how the Open Source stacks up in the above terms. Cost of Acquisition… No contest really Microsoft platformed software (e.g. ASPDNStoreFront) and the Windows Server operating system attracts traditional license fees. A fair few thousand pounds worth in this example… for the corporate buyer. In the not too distant past this would be a large capital expenditure, we’ll look at how Microsoft licensing strategies have evolved in the next post. It’s not right to pick a software vendor under the impression that you can forget about security as a result! Scalability / Functionality? Well it would seem that Microsoft has a somewhat larger R&D budget than the average Open Source project so perhaps new features and improvements are rolled out more quickly, and consistently in Microsoft? Then again look at the burgeoning developer communities in the Open Source world, again focusing on some of the more popular systems for eCommerce or web publishing. Close call. Skills and Support? Perhaps the same is true in support, training materials, and availability of skilled technicians…. My personal view is that Microsoft used to have the upper ground here, mainly on the grounds of ubiquity. 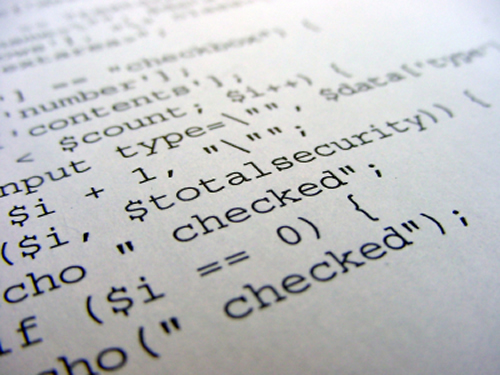 Open Source technologies and systems such as Magento or WordPress are becoming de-facto standards in their own right. As such, skill availability is a non-argument – Microsoft’s platform is massive and well supported, Open Source is massive and well supported provided you choose well. It is arguable that there is a risk involved in buying into support contracts for niche Open Source technologies from 3rd parties who don’t directly own / manage that codebase…. but there are now plenty of Open Source technologies that are no longer considered niche! So perhaps the conclusion is that Open Source is cheaper to acquire, perhaps no better or worse in terms of reliability and security, perhaps behind at the moment in “enterprise” functionality terms, and the consideration of the skills required to develop and support your systems should be based on the specific systems themselves, not the broad brush of “Open Source vs Traditional”. Open Source is now a viable solution, to a large (and rapidly growing) range of applications. Open Source software has long since achieved a level of credibility, through its large deployment and user base, its attractiveness as a lower cost way of acquiring software, and some of the support communities that are thriving around the cream of the Open Source portfolio. It’s not right to have a rigid policy of “only Open Source” or “only Traditional”, because the Open Source option now stands on its own merits and is totally worthy of evaluation alongside the more traditional commercial software vendors. The consideration of Open Source MUST become part of the of the software purchasing cycle – and the evaluation in terms of best-fit functionally, scale-wise, in terms of security and cost of supporting and developing must be undertaken against the traditional (large) software vendors. This must happen entirely on the merits of the capability to meet business requirements – which of course includes financials factors! It’s also interesting the government paper wants to keep OS out of the scope of policing, national security, NHS and benefits systems – this is all about mission critical enterprise capability – a space where the traditional houses and Big Blues of this work still make hay. Layer 5 believes that Open Source represents a perfectly viable option when implementing software. It’s not about the size of the company, it’s about which software is fit for the purpose. It follows, then, that Open Source must be considered a thread to the “license fee” model software vendor. We’ll look at that in our next post. A quick aside: The Microsoft versus Open Source in the eCommerce example above is a decision that Layer 5 Solutions studies , evaluates, recommends and makes with customers day in day out – the best-fit and gap analysis Business Analysis techniques to answer the question on a case-by-case basis is our bread and butter.